"Six days before the Passover, Jesus went to Bethany, where Lazarus was, whom he had raised from the dead. They gave a dinner for him there; Martha waited on them and Lazarus was among those at table. Mary brought in a pound of very costly ointment, pure nard, and with it anointed the feet of Jesus, wiping them with her hair; the house was full of the scent of the ointment. 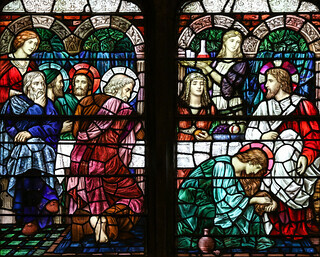 Then Judas Iscariot – one of his disciples, the man who was to betray him – said, ‘Why wasn’t this ointment sold for three hundred denarii, and the money given to the poor?’ He said this, not because he cared about the poor, but because he was a thief; he was in charge of the common fund and used to help himself to the contributions. So Jesus said, ‘Leave her alone; she had to keep this scent for the day of my burial. You have the poor with you always, you will not always have me.’"
– John 12:1-10, which is part of today's Gospel for Mass. Stained glass window from Grace Episcopal Church in NYC.